Region: Blend of various coffees from Indonesia. Cupping Notes: Dark roasted, heavy body, low acidity and delivers bold flavor. 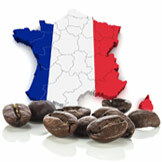 Buy fresh, specialty-grade Coffees at Wholesale Prices! To keep our coffees fresh, we only sell our coffees in whole bean. Click here to see our selection of Coffee Grinders.